There are five vowels and 21 consonants in English, right? Well, no. Vowels and consonants are sounds, not letters. 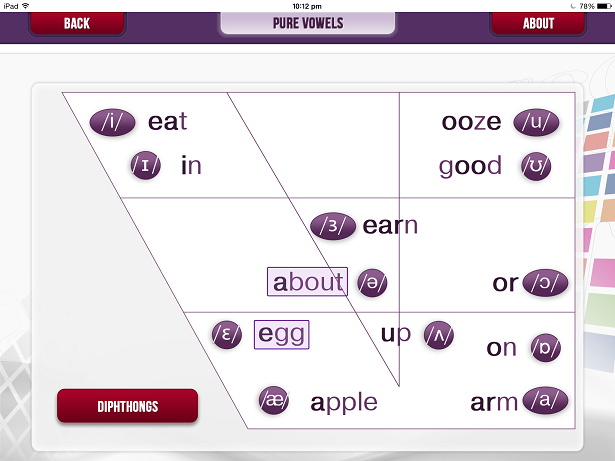 Depending on your accent and how thinly you slice them, there are about 20 vowels and 24 consonants. A vowel is a speech sound made with your mouth fairly open, the nucleus of a spoken syllable. A consonant is a sound made with your mouth fairly closed. When we talk, consonants break up the stream of vowels (functioning as syllable onsets and codas), so that we don’t sound like we’ve just been to the dentist for four fillings and the anaesthetic hasn’t worn off yet. Consonants require more precise articulation than vowels, which is why children find them harder to learn, and often end up in speech therapy after having become so cross at not being understood that they’ve started hitting people. Only a few children with severe speech sound difficulties (often called dyspraxia or apraxia) sometimes need therapy to help them produce vowel sounds correctly. Most syllables contain a vowel, though vowel-like consonants can occasionally be syllables. And to complicate matters, many English vowels are technically two or three vowels shmooshed together. (Just ignore the “c” with a cedilla, it’s slicing things a bit fine IMHO. Also ignore the “wh” if you say “whale” and “wail” as homophones). 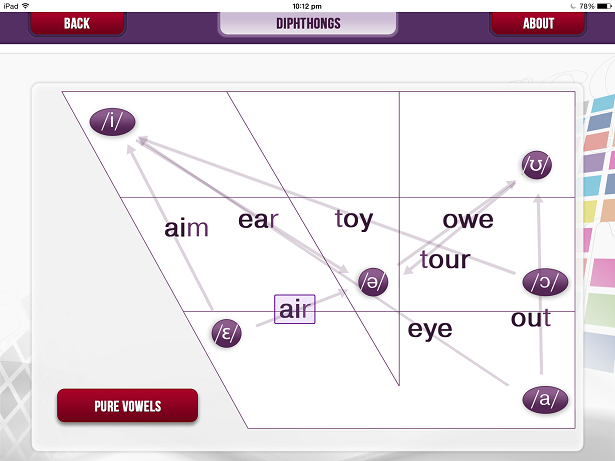 narrowing the vocal tract (“w”, “y”, “r”, “l”). The last four consonant sounds on the above list – “y”, “w”, “r”, “l” – are produced with less mouth constriction than other consonants, and in linguistics are called “approximants”. Approximants occupy a kind of linguistic grey area between vowels and consonants, in fact “w” and “y” are also known as semivowels. There’s very little difference between the consonant sound “y” and the vowel sound “ee” as in “see/sea/me”, and between the consonant sound “w” and the vowel sound “ooh” as in “moon/rule/grew”. These sounds are classified as consonants because they generally behave like consonants, that is, they’re (in) syllable onsets not syllable nuclei. In many English dialects, the sound “l” can be a syllable all by itself in words like “bottle” and “middle”. This is also true of the sound “n” in words like “button” and “hidden”. In these words, the tongue has just said “t” or “d”, so it’s already in the right place to go straight into the sound “l” or “n”, without saying a vowel first. However, we still write a “vowel letter” in this syllable (le, on, en) and we say a vowel sound in other words with similar final spellings, like “giggle” and “dabble”, “ribbon” and “beckon”, “happen” and “embiggen”. The sound “m” can also act as a syllable in words like “rhythm” and “algorithm”, again because the sounds “th” and “m” are physically very close together. In this case we don’t write a “vowel letter” in the last syllable, but we do say a vowel sound in the last syllable of most words spelt like this, like “autism” and “criticism” (click here for more, see right column). Tell language mavens who insist a consonant is never a syllable to stick that up their jumpers. Some consonants are produced using your voice (“b”, “d”, “g”, “m”, “n”, “ng”, “th” as in “then”, “v”, “z”, “zh” as in “vision”, “j”, “y”, “w”, “r”, “l”) and the rest are voiceless (“p”, “t”, “k”, “th” as in “thin”, “f”, “s”, “sh”, “ch”, “h”). Most consonants come in neat voiced-voiceless pairs – “p/b”, “t/d”, “k/g”, “th as in thin/th as in then”, “f/v”, “s/z”, “sh/zh as in vision”, and “ch/j” (yes, I read a recent Grammarly blog post, and have decided to start using the Oxford Comma). Try saying each of these sound pairs in turn, and you’ll notice that the main difference between each pair is that you use your voice for the first sound, but not the second one. If you are using your voice when you say the sounds “p”, “t”, “k”, “th” as in “thin”, “f”, “s”, “sh” or “ch”, you’re saying them wrong. This can confuse children about the difference between sounds, and/or cause blending problems (click here or here for previous blog posts on this). The sound “h”, is also voiceless, but lost its voiced pair somewhere down the crack between Old and Middle English, though its ghost still makes guest appearances as the spelling gh in words like “thought”, “night” and “daughter”. The nasal sounds “m”, “n” and “ng” don’t have voiceless pairs, but are made in the same spots in your mouth as, respectively, “p/b”, “t/d” and “k/g”. 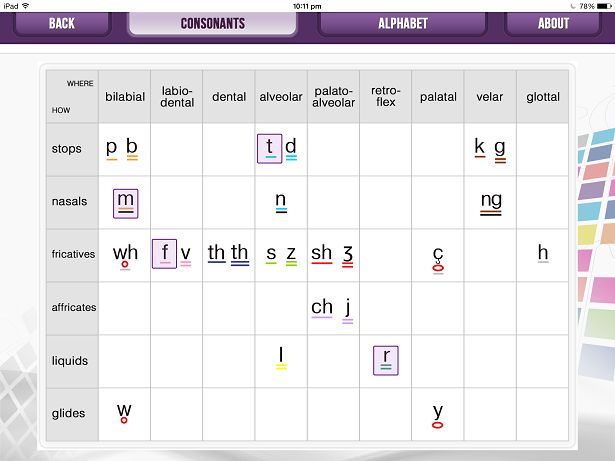 Here are the handy vowel charts from the Cued Articulation iPad app, but please remember it’s an app, so the red buttons marked “diphthongs” and “pure vowels” take you to these charts, they aren’t the labels for the charts they’re on. The chart headings are up at the top, and the sounds are organised from high front vowels at top left to low back ones at bottom right. All vowel sounds are voiced, unless you’re whispering or speaking Japanese, Quebecois, or a North American indigenous language like Comanche or Cheyenne. Vowels are sounds produced with the mouth fairly open, and differ by mouth shape, for example “ee” is a high front vowel and “o” as in “got” is a low back vowel. Some vowels, like the “a” in “cat” and the “i” in “big”, are said with the mouth in the same position from start to finish (monophthongs). Some vowels, like the “ay” in “paper” and the “I” in “hi”, move from one mouth position to another (diphthongs). There’s also one vowel in English, the “you” in “human”, which is actually a combination of a consonant and a vowel (“y” + “ooh”). But knowing this doesn’t help us spell it, there isn’t usually any need to notice the little “y” sound, which in some dialects is omitted (think of how the word “news” is pronounced in US English). In the English I speak, in which the consonant “r” is only pronounced before a vowel, a few vowels like the “ire” in “fire” and the “our” in “sour” contain three mouth positions (triphthongs). When teaching spelling it’s best to treat these as two sounds (i…e + r, ou + r). Smart children often notice that diphthongs are actually two sounds. This sort of excellent listening should give rise to much rejoicing and praise, after which they can be told that spelling gets mighty confusing if we slice these sounds so finely (e.g. the “ay” sound in paper contains two sounds, but represented by only one letter), so we usually treat diphthongs as single sounds. The only time I remember having to actively slice a diphthong in half for a learner was in order to explain the spellings of the homophones “gaol” and “jail”. We Aussies learn a lot about gaols in history class and from the family genealogy nut, though we’ve never found out why Great-great-great grandfather William Yates, a 20-year-old York chimney sweep, was transported to Tasmania for life on a ship called the Phoenix in 1820. If your family genealogy nut is in York and can find out, my family genealogy nut would be most appreciative. But I digress. The letter E in the ve in “solve”, the se in “house” and “please”, the ce in “dance” and “ocean”, the ze in “sneeze”, the the in “soothe”, the ed in “jumped” and “hummed”, the dge in “smudge”, and the che in “avalanche”. The letter I represents the sound “y” in words like “union” and “brilliant, plus it’s in the ti in “motion”, the ci in “social”, the si in “pension” and “version”, the gi in “religion”, the sci in “conscious”, the ssi in “passion”, and the xi in “anxious”. The letter U is a common way to spell the consonant sound “w”, as in “queen” and “penguin” (we usually write qu and gu, not kw, cw or gw), and is also part of the gu in “guess”, the gue in “league”, the qu in “liquor”, the que in “boutique”, and the “bu” in “build”. The sound “you” as in “human” is actually a combination of a consonant and a vowel (y+ooh), though it’s mostly spelt with vowel letters: U as in human, U…E as in tune, EW as in few, UE as in cue or EU as in feud. Nouns that start with this sound like “unicorn”, “ute” and “Europe” thus start with a a vowel letter but a consonant sound, which is why we say “a unicorn”, “a ute” and “a European”, not “an unicorn”, “an ute” or “an European”. The obvious one here is the letter Y, weirdly called a consonant letter despite mostly representing vowel sounds, in words like “my”, “duty” and “gym” (no, I haven’t been doing enough exercise lately either). This probably happened because traditional phonics focuses too much on first letters in words, where the letter Y represents a consonant sound (except in words like “Yvette” and “yttrium”). The letter W is in the aw in “saw”, the ew in “new” and “grew”, and the ow in “how” and “show”. The letter Y is in the ay in “play”, the ey in “grey” and “valley”, the oy in “boy”, the ye in bye, the y…e in “type”, and the yr in “myrtle”. All four letters representing the vowel sound in the word “myrrh” are supposedly “consonant letters”. The letter R is in the ar in “car”, “warm” and “scarce”, the er in “her”, the ir in “bird”, the or in “fork”, the ur in “curl”, the air in “hair”, the are in “care”, the ear in “hear”, “learn” and “bear”, the ere in “here”, “there” and “were”, the eer in “beer”, the oar in “soar”, the ore in “sore”, the our in “pour”, the oor in “door”, the eur in “poseur”, the aur in “Minotaur”, and in the English I speak and write, the r in “flour”, re in “centre” and our in “harbour”. The letter L is in the al in “calm” and walk, and the ol in “yolk”. The ghostly letters G and H are in the igh in “high”, the ough in “thought”, “drought”, “though”, “through” and “thorough”, the eigh in “weight”, the augh in “caught”, and the aigh in “straight”. The letter H is also in the ah in “galah”, the eh in “meh”, the eah in “yeah”, the oh in “John”, the ooh in “pooh”, and the uh in “duh”. If I can write it and you can read and understand it, it’s a real word. So, what’s the difference between vowels and consonants? Vowels are the loud sounds that form the nuclei of each syllable, and consonants separate them. The letters E, G, H, I, L, R, U, W, Y are used as/in spellings representing both vowels and consonants. This entry was posted in consonants, sounds, spellings, vowels on April 20, 2015 by alison. Why do you say that "b" "d" and "g" are voiced, when "p" "t" "k" aren't? I feel I can say the first three voiceless at least as easily as the second three? I know that this would be almost impossible to explain without actually articulating them to me, but I felt I was doing very well extending my knowledge with the rest of what you were writing until I got to that bit! Hello Alison, great page – great explanations! thought it worth pointing out that there has been a change ot the SAE vowel symbols. is there any chance you can update – so that i can direct students to view your site? It would confuse them seeing the old symbols. Harrington, Cox and Evans updated SAE vowel set a few years ago. It’s still not in general useage, but it is now routinely taught at Universities in Australia. I’m not sure what SAE stands for in this context, but I can report that the Macquarie Dictionary still uses the Mitchell-Delbridge system, and Year 11 and 12 students studying VCE English Language also learn a slightly simplified version of of it, rather than the Cox, Harrington et al system. What an excellent sauce! Will practice getting my mouth around it all. Seriously though, I am trying to remember the name for the sound which is neither a vowel nor consonant but a sound which can occur anywhere in a word e.g. At the beginning as in “Australia” (not Ostralia) and “annoy” or at the end of a word as in “the” when it precedes a consonant e.g. “the box”. It’s like an “uh” or “ugh” sound but I don’t actually know how to write this sound. It is like “a” but not “ay” as in “say”. Any ideas? I think you mean schwa, the neutral or unstressed vowel. It’s still a vowel, not a consonant, in fact it’s the most common vowel in English, which being a stress-timed language has a lot of them, e.g. the first sound in alone, erupt and Olympics and the last sound in butter, collar, doctor, flour, centre, harbour, sofa and tapir. Often it simply disappears in connected speech e.g. we often don’t say the middle vowel in chocolate or different. I love the way how you layout the syllable. How can i down load or can you send me more of your work so i can teach my kid? I have lots of free stuff in my website shop, and on the website, but without knowing your child I can’t know what it is you need, sorry. Hope you find it!